> Dried Chilies>Japones>Dried Chile Japones 1 Lb. Japones Chile is a small, pointed chile, 2 inches long and 1/2 inch wide. This chile is similar in appearance to the De Arbol. Though the walls of the Japones are thicker. 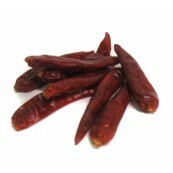 Dried Japones Chiles are medium hot and good with Asian dishes. Japones are also known as Hontaka, Santaka or Oriental style chile peppers. Though they’re native to Mexico and widely used in Latin American and Caribbean cuisine, they are extremely popular in Japan and China as well. These peppers are very hot, measuring anywhere from about an 8 or 9 on heat scale of 1 to 10. Japones Chile is a small, pointed chile, 2 inches long and 1/2 inch wide. This chile is similar in appearance to the De Arbol; though the walls of the Japones are thicker. Japones are an important ingredient in Sichuan cooking. Try them in stir fries, salsas and chutneys. 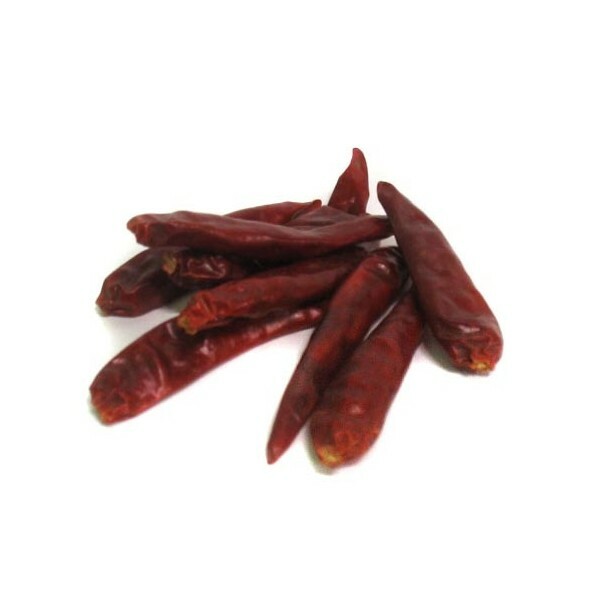 These chiles are great for infused oils or added to breads, sauces and relishes. They can also be dry roasted and ground for an extra hot ground pepper.